Web Content Management (WCM) has evolved radically as it has now forms the backbone to Experience Management platforms that manage, deliver and optimize experiences across every step of a customer’s journey. The Forrester Wave is Forrester Research’s evaluation of vendors in a software, hardware, or services market, written for the role professionals they serve. 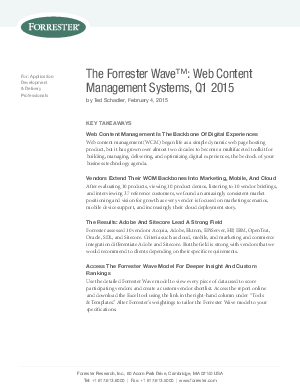 With a rigorous assessment process using thirty-five different evaluation factors, Forrester Research appraised WCM solutions from ten vendors.